As the freezing temperatures continue, many people are looking forward to the sunshine and enjoyment afforded by warmer weather. If you own a swimming pool for personal or commercial use, you may be thinking about upgrades for your aquatic system. There is a wide variety of swimming pool accessories available that can enhance the enjoyment and care of your pool, making it safer and cleaner for everyone. Alpa Pools & Spas is proud to be a top supplier of swimming pool supplies for New Jersey customers, delivering the best pool cleaning services and equipment since 1969. We work hard to deliver quality results with each and every transaction, and our swimming pool supply store is here to keep your operations up and running all season long. Today, we’ll continue to discuss swimming pool equipment upgrades that may enhance your life in terms of convenience, enjoyment, or both. When done, be sure to stop by our store in North Haledon for help with your system! Being able to make your pool as safe and clean as possible is a major benefit when it comes to pool cleaners. For years, owners have used a medley of swimming pool chemicals to sanitize their pools. The reason for this is because of chlorine, a chemical that is very useful in keeping your water sanitary. However, the combination of this material and human sweat and urine creates chloramines, which are gases that can be harmful if not properly mitigated. The best way to clean your water has been to replace it completely. Modern technology has introduced UV light sanitation systems, which work to reduce chlorine down to a safe level. In many cases, UV systems can drop chlorine levels down to .5 parts per million (ppm), which is safe enough to drink. Swimming pool covers work two-fold to keep your system convenient and enjoyable. For one, covers help to reduce or even stop evaporation. This can reduce maintenance needs and allow for less time spent filling the pool and more time focusing on other projects. Covers are also essential for keeping dirt and debris out of your pool, retaining cleanliness for your customers. There is a variety of auto fillers available, each utilizing their own method for replacing lost H2O. Some devices are wired while others are not. In any case, fillers are ideal for keeping the volume of your pool optimal at all times, reducing the need for ongoing maintenance. Pool owners know that low water levels can be dangerous for your swimming pool equipment, burning out expensive devices in the process. Another issue comes from filling when too much is utilized, causing flooding. Auto fillers help you to avoid landscape damages and wasted water. When it comes down to it, there is a wide variety of swimming pool accessories available to make your life easier, save on energy costs, improve swimmer safety, and more. 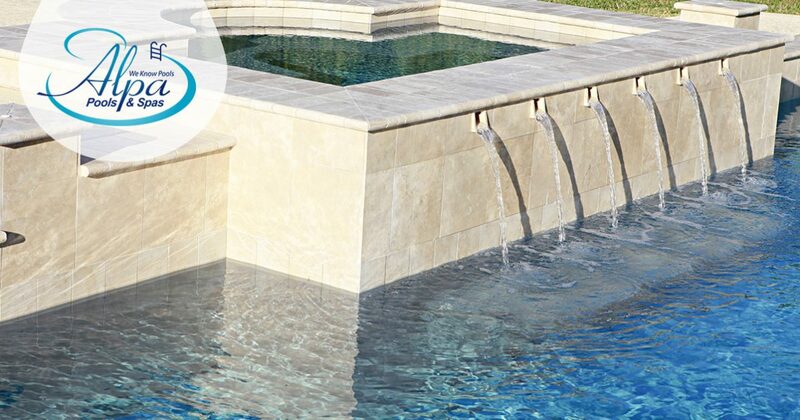 Alpa Pools & Spas is here to serve as your go-to provider of quality swimming pool supplies in New Jersey, delivering expert guidance in addition to our comprehensive inventory. Contact us today to learn more our be sure to stop by our swimming pool supply store for any help you need!